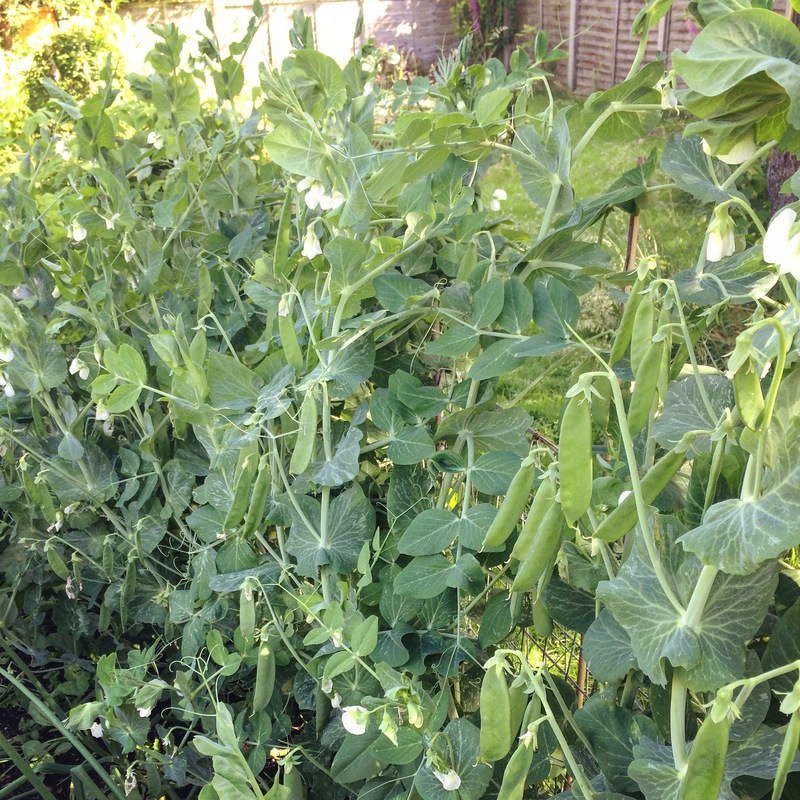 The harvesting has begun – we’ve already got a fridge full of calabrese and during the last fortnight I’ve been picking fat pods of peas every other night. 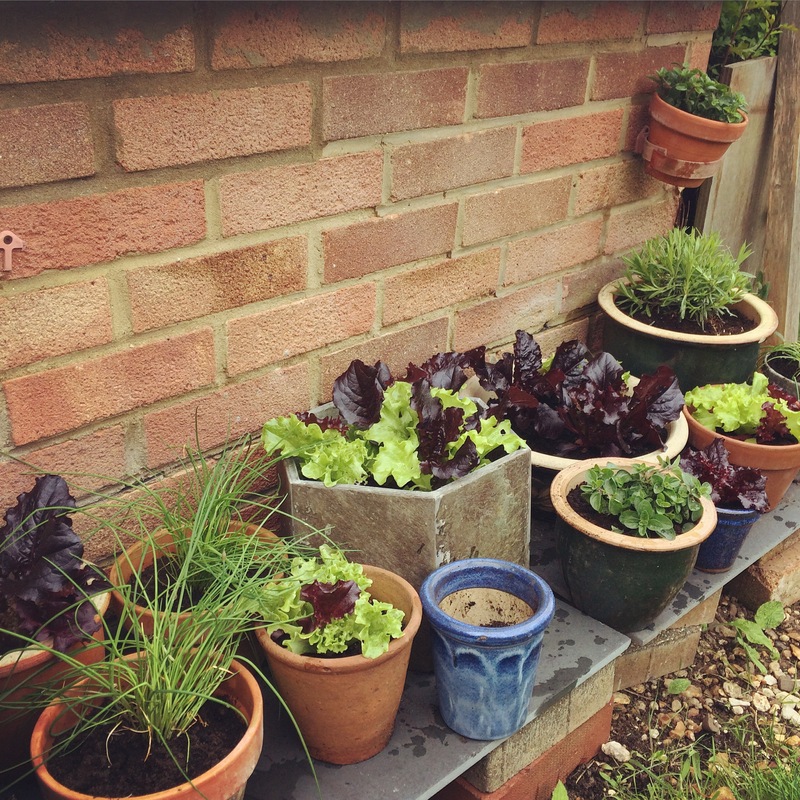 I only put in a handful of plants, but they’ve thrived, carefully planted at the back of the veg patch so as not to overshadow other crops and happily scrambling up some old metal grilles that were used to protect the old chicken ark from Mr Fox. 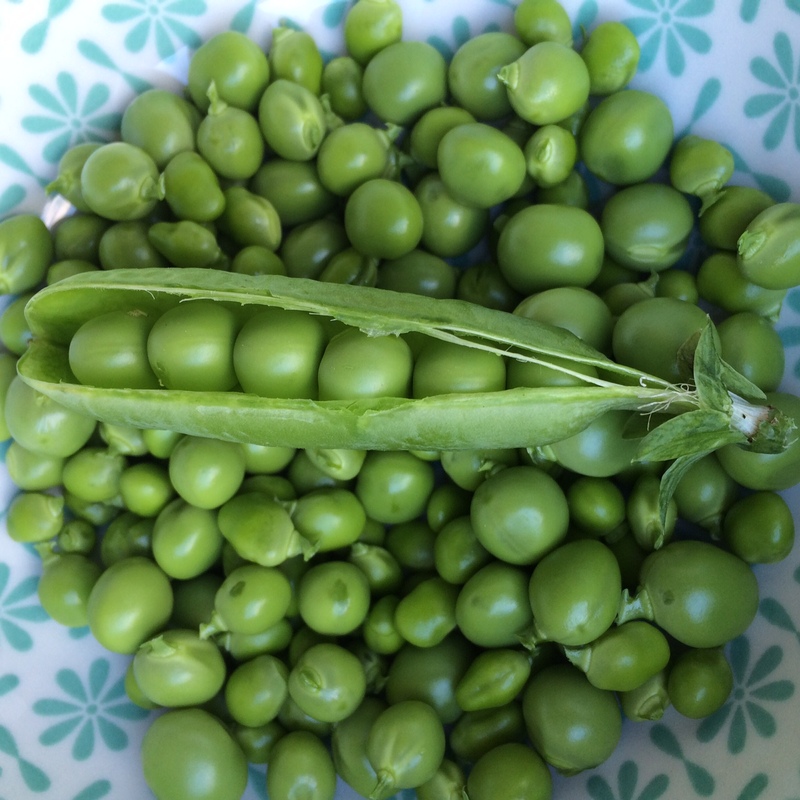 I love podding peas – it’s intensely satisfying, opening up pods of neatly packed chubby green globes of goodness and popping them out. 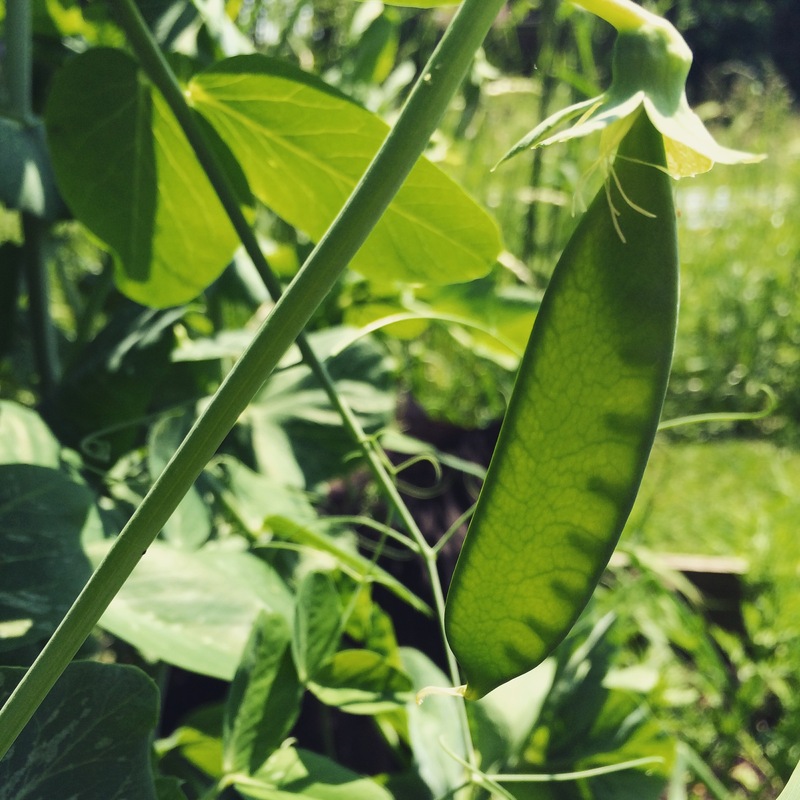 I hope that next year I’ll be able to feed my daughter freshly podded peas to encourage her to enjoy tender homegrown, organically produced fruit and veggies. The calabrese has taken on a life of its own, and where I harvested big florets off the top of the plants, smaller shoots of tender stems have sprung up, willing to give us just that little bit more before the plants go over. The garlic hasn’t been so virulent; with lots of rain this year we’ve had our worst bout of rust, so not sure how the bulbs have fared. We’ll see… as long as we have something to use I won’t mind too much as homegrown garlic is just unbeatable. The downside though is that we won’t be able to grow any kind of alum in that same patch for three years. And on my two tiny apple trees, we have some fruits appearing. The Blenheim Orange must be on a dwarf slow-growing rootstock, but it’s managed to produce a few fruits this year. The Charless Ross is much more vigorous and the offerings are looking so much better than the lone fruit produced last year. I’m already thinking about apple crumble! 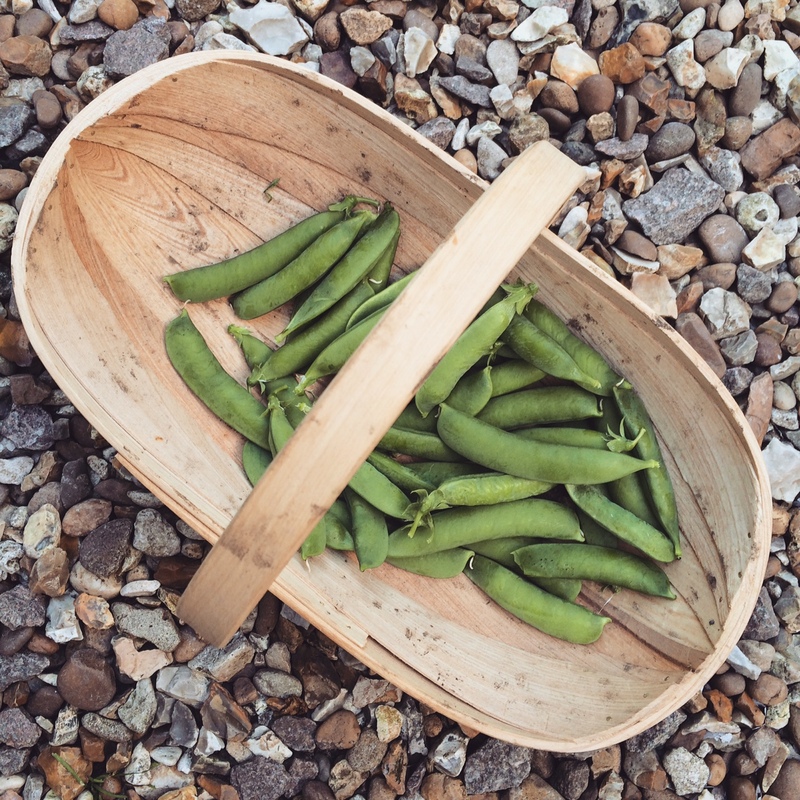 There is a definite kind of peace in wandering about the veg patch before dinnertime, picking and harvesting fresh, homegrown food before preparing it for dinner. It’s like a piece of life’s puzzle that just slots in and makes you feel a little bit more satisfied, a little bit more complete. I might not be the world’s best food grower, but it doesn’t matter. Because next year, I can always try again. Earlier this week we had a thunderstorm of pretty epic proportions. In fact, I have no shame in admitting that I almost crapped myself a couple of times, thanks to some ear-splitting booms and claps that rolled out of the skies. It wasn’t just a show of sound and light though; after a long build up in which the bump and I slowly melted under a fairly oppressive cloud of intense humidity, the heavens opened. 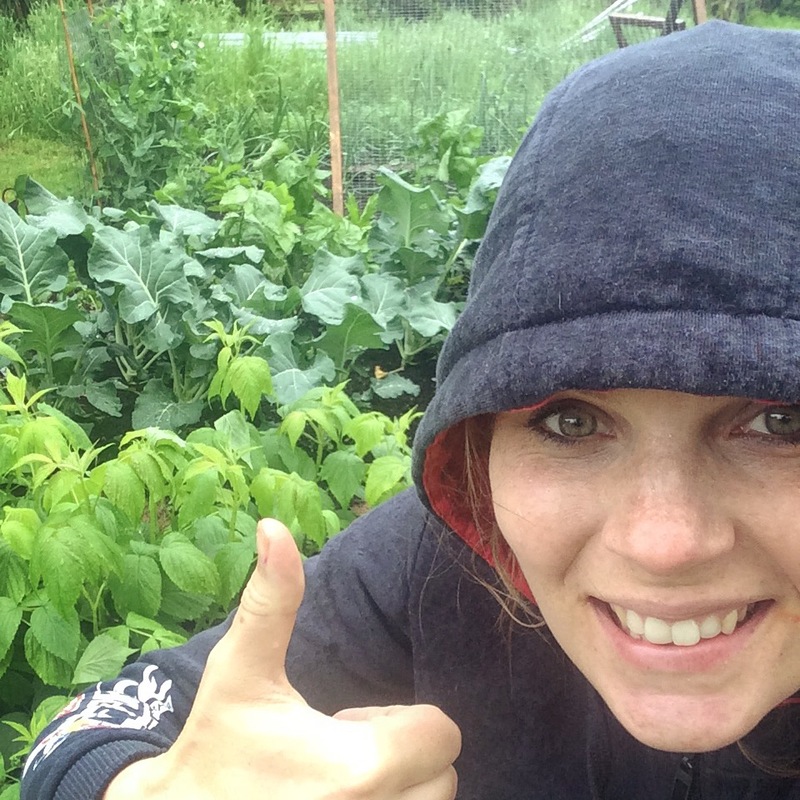 The downpours were long and penetrating – just what the veg patches needed – and the Smallest Smallholding has, as expected, gone into overdrive and everything is growing at a rate of knots. My onions and perennial wallflowers were the only plant life that took a beating from the storm, whilst everything else has thrived with a heady combination of hot days and squally showers. Another benefit of this mix of sunshine and rain is that the soil is virtually fluffy, so weeds (even the mile-long tap roots of thuggish alkinet) are so easy to pull. This, together with my no dig approach, has meant that keeping on top of the veg patches has been so easy. 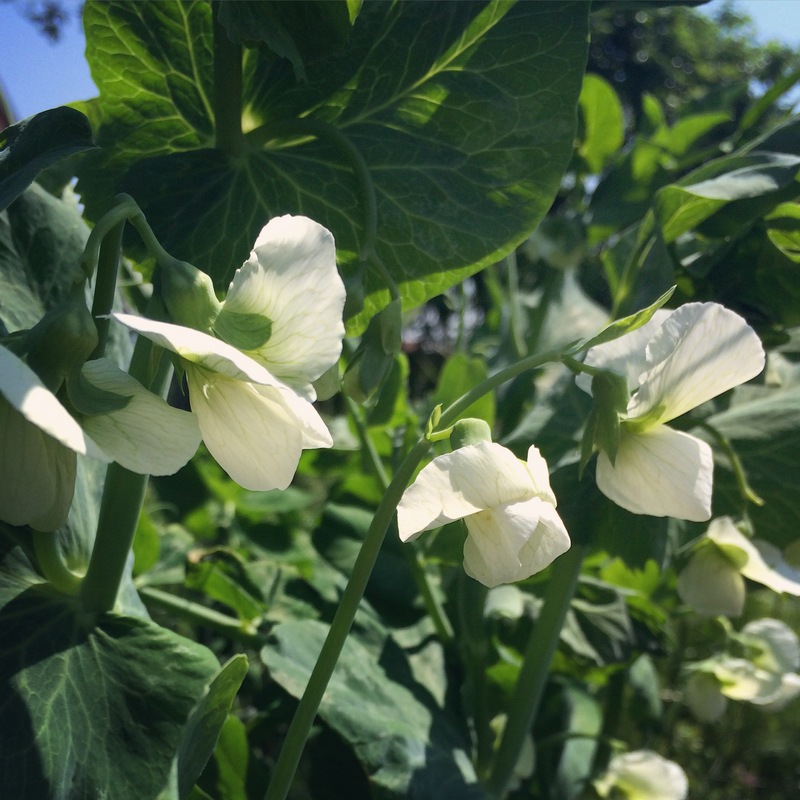 So it’s the first week of June and the veg is romping away, the roses are blooming and the Smallest Smallholding is just so full. This time of year is so invigorating. 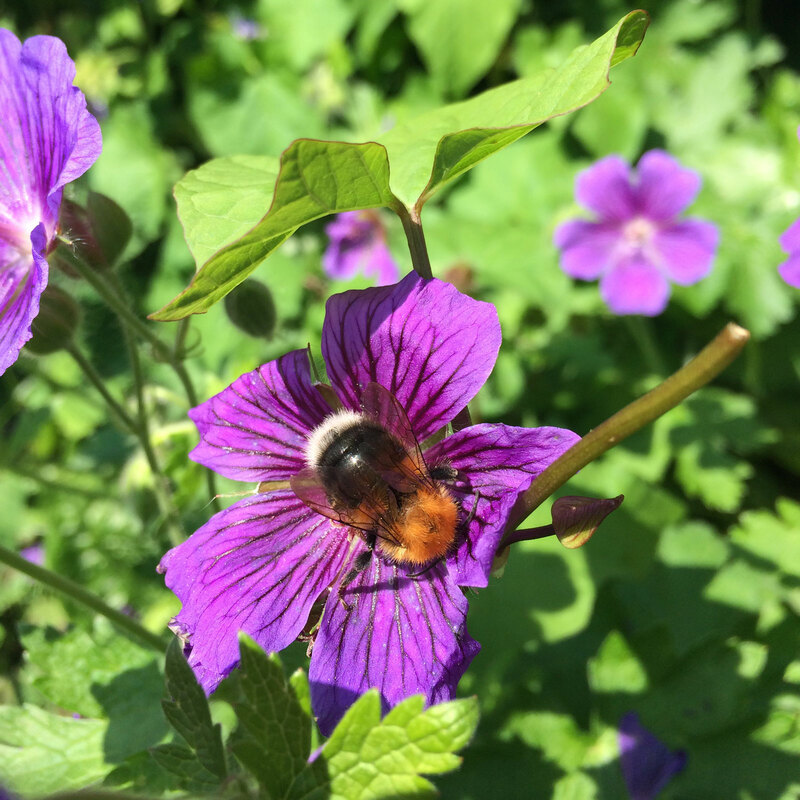 Armies of honey bees and fat bumblebees are jigging and rubbing themselves with tangible glee all over our geraniums, lavender, foxgloves, toadflax and alliums. The fledged blackbirds are out in force, and the hedgehogs are resolutely on slug duty at night. I’m having a battle of wills with an undisclosed feathered or furry critter who keeps pulling out my strawberry plants (two miserable looking plants have survived) and it’s all a bit wild and out of control… and when I stand back and look… there’s still so, so much to do. But do you know what? It’s totally OK. It’s keeping me busy, occupied, and dare I say it… happy. And in three weeks I shall be on maternity leave. 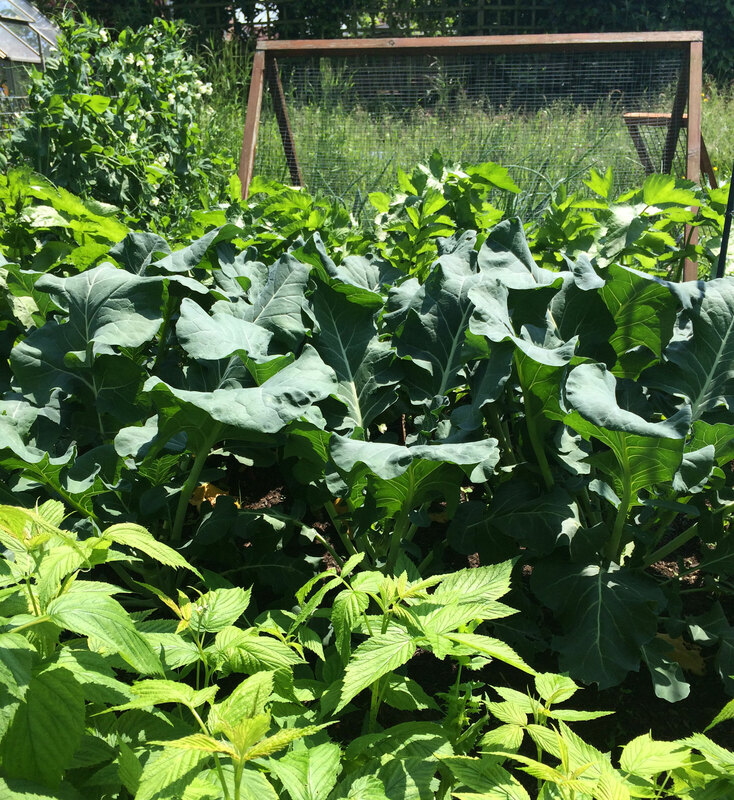 Yes, we have a list of things as long as my arm to do in the house before my due date, including some significant renovations and decorating, but I can’t keep my mind off my vegetable patches, my borders, my plans for everything. I should be worried, I should be brimming with anxiety and how the hell I’m going to cope with the weeks and months ahead. The state of the house should have me wringing my hands and raging. But somehow, my garden is taking that energy and channelling it into something positive. Something I can build on in the future, and something I can make good with. Spring is tempting me. When the sun is out, it’s glorious and the warmth is invigorating. The trouble is, we’ve been plagued by clouds and even sleet last Saturday. But I’ve been trying to plough on (not literally) and continue to make even the smallest steps of progress on my little urban garden patch I call The Smallest Smallholding. The area between the kitchen door at the back of the house and the garden gate is fairly redundant at the moment, but in summer (and especially now we’ve been keeping the hedge height down), it can be a bit of a sun trap at certain times of the day. A bit of bare wall had become a dumping ground for old disused pots and bricks, so I decided to rip out the perennial weeds and try to smarten it up a bit. With the short brick wall behind it the warms up in the sunshine, I thought it would be the perfect spot for putting a mini container garden. Something a bit closer to the kitchen, and something to bring a bit of life and cheer to the rambling mess outside the conservatory. I started this mini side project a couple of weeks ago, using some old slates and bricks to create a shelf to keep the ants out of the pots. I began by collecting up all the sad and neglected old pots, and began planting in some lettuce plugs but this weekend I decided to add a few flowering herbs in (anything for the bees is fine by me), for both fragrance and colour. 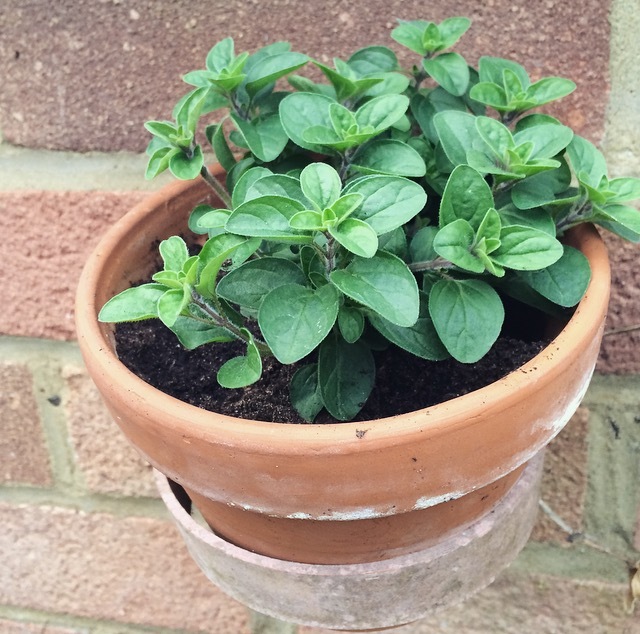 I might even get around to using the herbs in the kitchen this year! 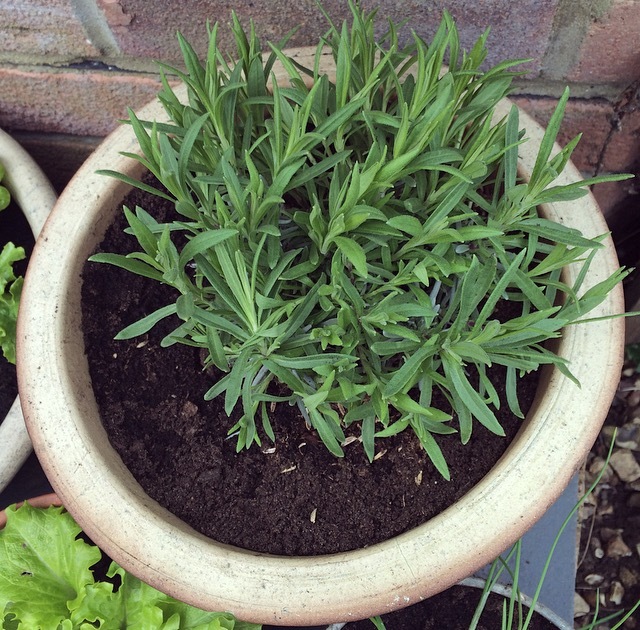 I also found a lovely compact lavender that I’ve not come across before called ‘Lady Lavender’, which has now been potted up in an old terracotta pot and added to my growing container garden collection. 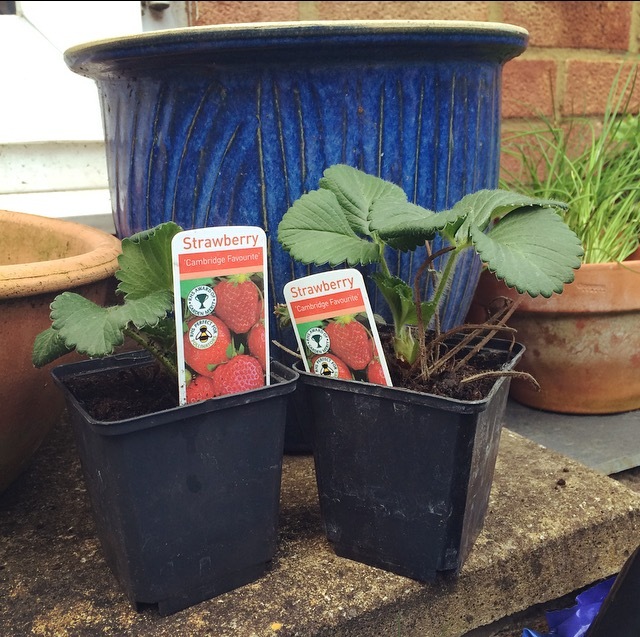 Feeling a bit fancy free, I indulged myself with two 95p ‘Cambridge Favourite’ strawberry plants – breaking the bank, right? – which I need to pot on. I am considering pooling my pennies together and getting a few more and pulling out the old terracotta strawberry container, but I’ve not had a huge amount of success with it in the past since I’m fairly forgetful when it comes to watering. But this year, you never know. I’ll just have to see if I’m up to it since everything is becoming much more of an effort as I pass the 22 week mark in my pregnancy. I’ll just have to keep ploughing on as I best I can (and remember to water).